Culture has been increasingly entering the global urban agenda – being recognised within the Sustainable Development Goals, the New Urban Agenda, Agenda 2063 and through Agenda 21 that argues for culture to be recognised as the fourth pillar of sustainability. Cultural policy mobility through instruments such as UNESCO Conventions have resulted in a growing recognition for the important of cultural policy, and since Habitat III, this has increasingly coalesced around the urban. With this comes a range of risks and opportunities, and the purpose of this project is to explore how cultural heritage can better contribute to realising more just cities in different contexts. To date the project team have produced a report on the cultural heritage and urban development through the lens of festivals; an article for a Special Issue in the International Journal of Cultural Heritage; have engaged in collaborative writing and speaking –CHIME Conference and have collaborated in the search for new funding. This has culminated in a new project funded by the British Academy on Mapping and Mobilising Heritage Values for Sustainable Urban Development. Contributing / shaping global debate and narratives on culture and development. This will involve engaging the SDGs, New Urban Agenda, Agenda 2063, Agenda 21 and other relevant documents, in the interest of exploring how these narratives can contribute to the process of realising just cities. Comparing the implementation of cultural planning, mapping and cultural impact assessments in the various Local Platforms. Cultural planning is about surfacing cultural practices and leveraging cultural and place identities through integrating culture into urban planning processes. The Gothenburg Platform is planning to implement the City-developed CIA tool in collaboration with officials. The Cape Town Platform is working with the City of Cape Town to implement and monitor cultural mapping and planning. The Kisumu Platform is eager to implement a cultural mapping and planning process. This project will therefore collaborate and compare the implementation of cultural planning in three Local Platforms. It is acknowledged that culture and cultural heritage are necessary components in a process aiming at ‘Realising Just Cities’. This project draws on experience, knowledge and outcome of projects from different Local Platforms to inform policies and disseminate recommendations, knowledge and experience to a wider audience and to other cities, local governments and regions. Rike Sitas är forskare vid African Centre for Cities sedan 2013 och koordinator vid Mistra Urban Futures, UrbanAfrica.net, Cities Alliance Africa Think Tank, Public Art and the Power of Place. Victoria Simpson is the Research Programme Coordinator of the Sheffield-Manchester Local Interaction Platform for Mistra Urban Futures. After teaching, research and management appoints, Victoria joined the Urban Institute in September 2016. Drawing on her research background, Victoria coordinates support across a portfolio of UK and EU research grants. Helene Brembeck is Professor at the Center for Consumer Research (CCR), Gothenburg Research Institute (GRI). Dr. Fredrick Z.A. Odede is a Deputy Lead Researcher at the Jaramogi Oginga Odinga University of Science and Technology. Alicia Furtuin is a Research Project Assistant at the African Centre for Cities, Cape Town. Laura Ager is a freelance event organiser and film programmer. 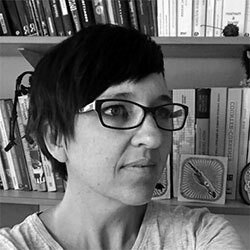 She is currently a PhD candidate at the SURF Centre, School of the Built Environment, University of Salford Manchester, on the AHRC Cultural Intermediation project. She is researching how universities interact with urban creative economies, with a particular focus on the role of festivals as networks of creating and distributing meaning and value.